Fits the Evolution ST1400 & ST2800 (Sold Separately). with optimised gearbox & blade system. Cuts angles accurately & easily. For improved visibility of the cutting line. For easier transportation & protection. Optimum visibility of your cutting line with LED Light & channelled air flow. Easy to transport and carry around the workplace with storage bag included. 4m cable gives you the maximum power and the extended reach you need. 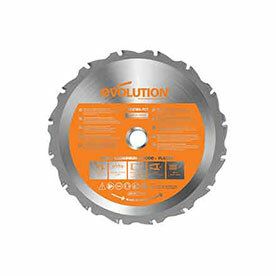 The arbor size of the R185CCSX+ is 25/32”.